Santa has a BIG job, so he needs lots of helpers. I happen to think SLPs need helpers too! Let me send you some helpers in the form of materials! 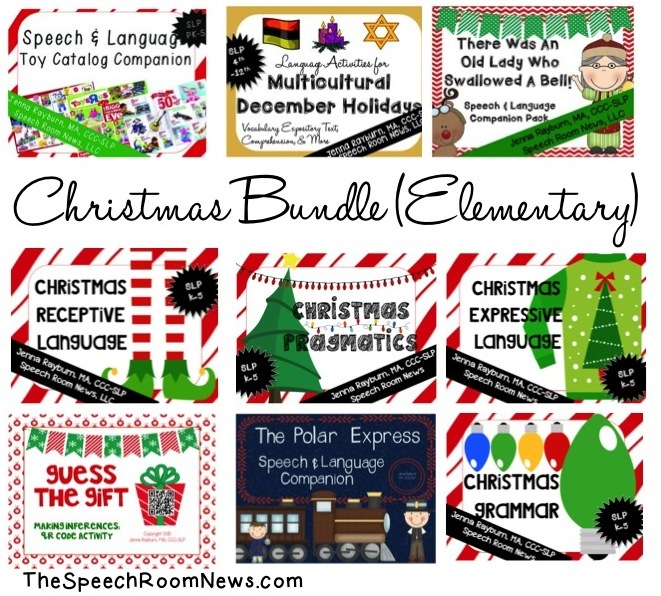 I’ve got some new Christmas themed materials to help you get through December! I’ve posted several new Interactive Vocabulary Books. There are two Holiday sets. I added some Winter Sets in case your school has a ban on all things holidays. Interactive Vocabulary Books: Winter Treats features two yummy winter snacks. Interactive books give little hands something to do. They also have a very clear ending. The kids can see if they get the 12 pictures done they are finished with this activity. I can work on many additional goals (verbs, pronouns, functions, attributes, etc.) while targeting this activity. This meets the curriculum vocabulary for my preschool programs during the first month of school. 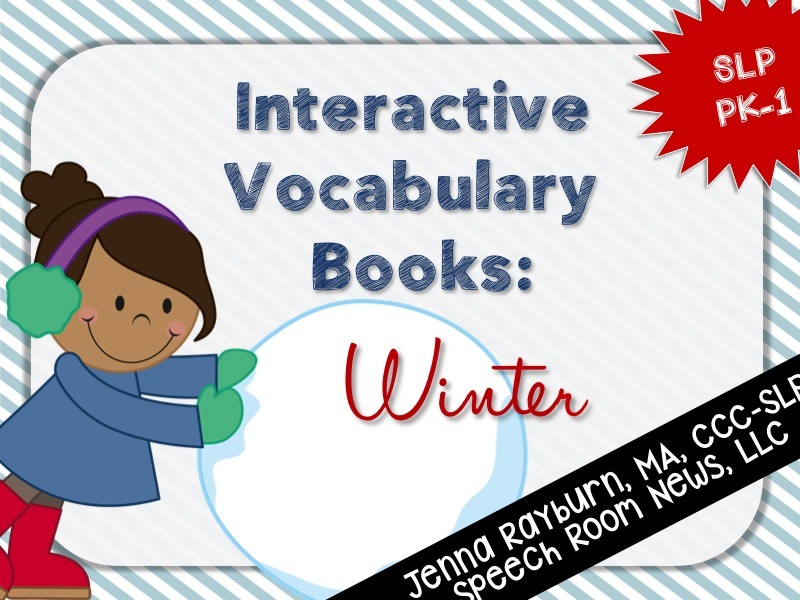 A Winter Set of Interactive Vocabulary Books focuses on winter activities. 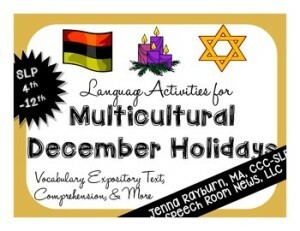 If you’re working with late elementary, middle, and high school students you’ll want to check out my Multicultural December Holidays Packets. It’s a ton of facts, expository text, vocabulary, etc about three different holidays. I used it through the whole month of December. Just pick one holiday for each week! I just gave the set a facelift so it’s more visually appealing! You can grab it in my TpT Shop. Be sure to download the freebie for details about what’s included! Gingerbread Concepts is a great way for preschooler and early elementary aged student to work on positional concepts and following directions. This activity is created to target following directions and positional concepts while building a gingerbread house. Give each student one gingerbread house or castle (pages 3-4). Cut out each of the gingerbread people, candy, and frosting pieces (pages 5-12). Game One: Have the students use a cookie sheet with edges to help keep the small pieces on the table. Print and laminate the direction sentences. Concepts are targeted in 25 direction strips on pages 13-17 targeting in, on, in front of, over and under. 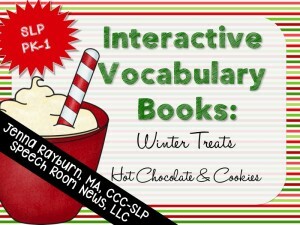 Let your student pick a sentence strip and then follow that direction to build the gingerbread scene. Game Two: Barrier game. Give each student a cookie sheet with edges and one gingerbread house or castle. Place a file folder sheet between the two students so they can not see each other’s gingerbread house. Every player should have the same set of materials in front of them. The players take turns giving the other players very specific directions (per ability level) on how to arrange the materials in front of them. The goal of the game is to have all the players’ materials look the same at the end of the activity. Use the sentence strips on pages 18-20 to support your students’ ability to give instructions. 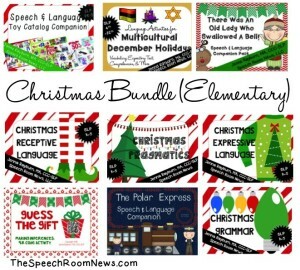 Last but not least I put together a Christmas MEGA Bundle! It has a whopping NINE sets in it! This is the best savings you’ll find in my shop! 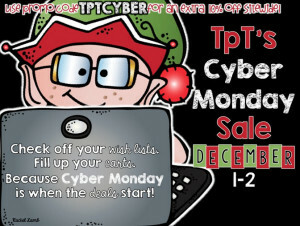 Don’t forget the code TpTCyber in the big sale. My shop is all ready for the holidays! « #ASHA14. It’s a wrap!